This tutorial will show you how to set up your very own 2D world using only free and open source tools. 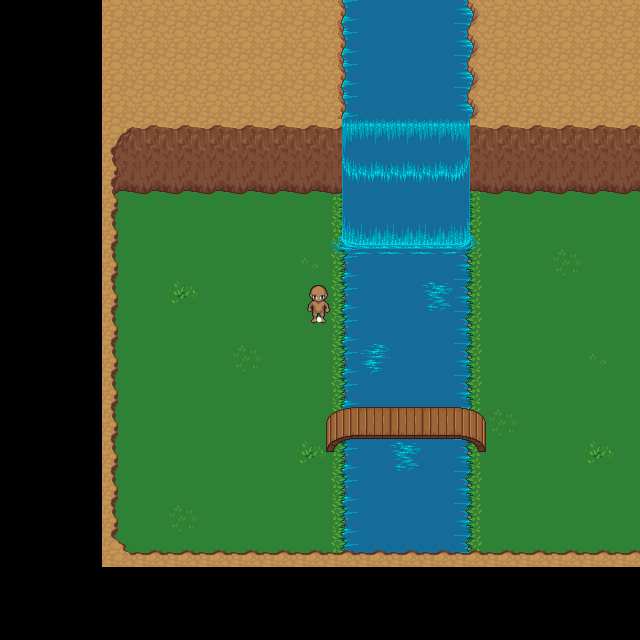 The tools we will be going over are Tiled, a tile map editor; LÖVE, a 2D game framework; and Simple Tiled Implementation (STI), a Lua module I wrote that imports and renders Tiled maps using LÖVE. 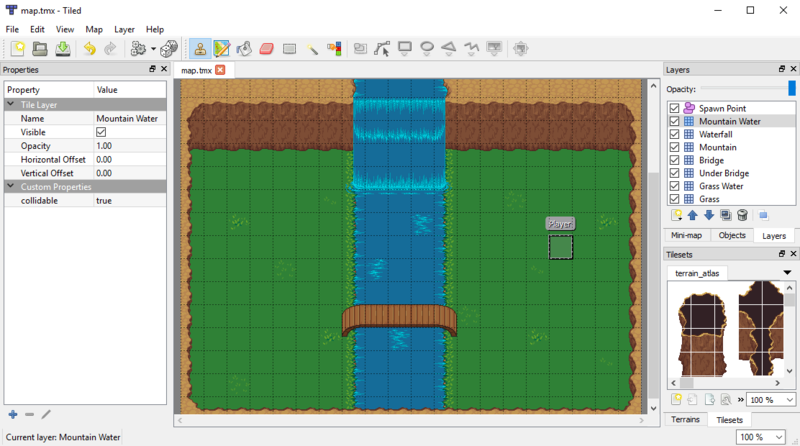 This tutorial assumes that you are familiar enough with both Tiled and LÖVE that you can create a simple map and run LÖVE programs. If you have never used or heard of these program before, I highly recommend downloading them and tinkering with them a bit before continuing. To begin, we want to create a simple map using Tiled. You can create your own tile atlas using any image editor, or download a free one from Open Game Art. In my example map, I have created a map with several tile layers and a single object layer with an object named "Player". This object will be used later on to spawn our player so make sure you create and name at least one object. With our map created, we want to export it as a Lua file by clicking File > Export or by pressing ctrl+E and selecting Lua files (*.lua). It is worth noting that Tiled's default compression method is Base64. If you are using a version of LÖVE prior to 0.10, you will need to make sure that the map compression is set to CSV. It is also worth noting that Tiled formats image paths relative to the map's location. You need to make sure that you save your map in the same directory structure that your game will be loading with, or else you might have trouble loading your map. Now that we have our map export ready, it is time to start writing some code. We will start by creating main.lua and putting in a basic LÖVE skeleton. This skeleton will allow us to load our map and other assets, update our map every frame, and render the map to our screen. With our skeleton made, we want to import the STI module, load the map, and get it drawing on screen. It is surprisingly easy to do as STI takes care of a lot of the work for you such as loading (and caching) images, batching the tiles for faster drawing, etc. Amazing! We added just four lines of code and now our map is being drawn! But hey, what is that ugly box? That is our Player object that we created. Obviously we don't want that to be a box so let's create a player object. First we need to add a new Custom Layer to our map. This layer will be used for holding dynamic data that lives in our world such as players, doors, or other objects that can get added, modified, or removed throughout the lifecycle of the game. With our new layer added, we want to populate it with some data. We want to take the X and Y position from our map object and give it to a new dynamic object that we will call player. We also want to load an image to use as the player's sprite, and we want to offset that image when it is drawn so the player's position is at the sprite's feet. 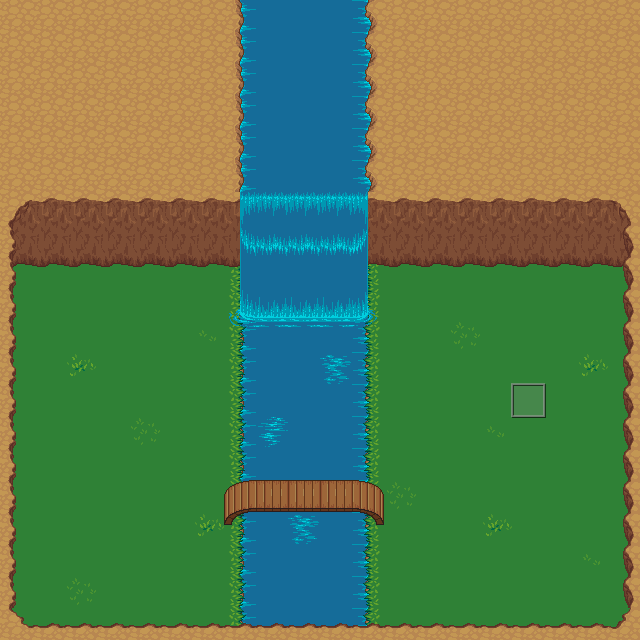 The offset values I used here worked for my image, but you may need to experiment to get the right values for your sprite. It is worth noting here that Tiled supports adding custom properties to any object or tile. You could store the offset values as object properties and then grab them from object.properties in Lua. In my example below, I simply hard coded the ox and oy values to keep things simple. With our player object created, we want to draw it on screen. Every layer in STI has its own update and draw callback functions that can be overridden if necessary. Each layer type has a default callback that can be accessed through STI's API except Custom Layers which have empty callbacks. To get our player to draw, we are going to need to override our new layer's draw callback. We are also going to want to remove our old Object Layer since we've extracted all the data we need out of it. If we wanted to keep it around, we could set layer.visible to false to hide the ugly boxes, but we're just going to kill it. Whoa, there it is! Our player sprite! "But wait!" you might be saying, "you said this data was dynamic! Our object is just sitting there!". Well, you're right. This is a player object and we need to give it some controls. I am going to ignore the great advice from a previous Lua Space article for the sake of simplicity, but I do not recommend writing player controller code like this. Definitely check that article out! In our player controller, we will be overriding the layer.update callback to detect if certain keys are currently being pressed and if so, update the player's x and y positions by some predetermined speed value, in our case, 72 pixels per second, or three tiles. The key here is the per second bit. Since lots of computers run at lots of different speeds and frame rates, we can't hard code our per-frame values. We will be multiplying our speed by dt or Delta Time, a speed normalizer that LÖVE provides us. dt ensures that no matter how fast or slow the system running our game is, objects will move the same per-second distance. Cool, we can now move our player around the screen! But that's only half the battle. We also want to centre the player in the screen so that the player never runs away from us. Instead, we want the world to move around our player. How do we accomplish this? LÖVE provides graphics transform tools such as translate, rotate, and scale that will give us the illusion that our player is static and the world is dynamic, instead of the other way around. And there we have it, our player can walk around the world and always remain in the centre of our screen. We can also scale our world so that players using screens with different resolutions all see the same stuff instead of maybe having an advantage because your screen resolution is larger than someone else's, or having graphical glitches, or any other issue that could arise. Alright, now let's put it all together and see what we've got! 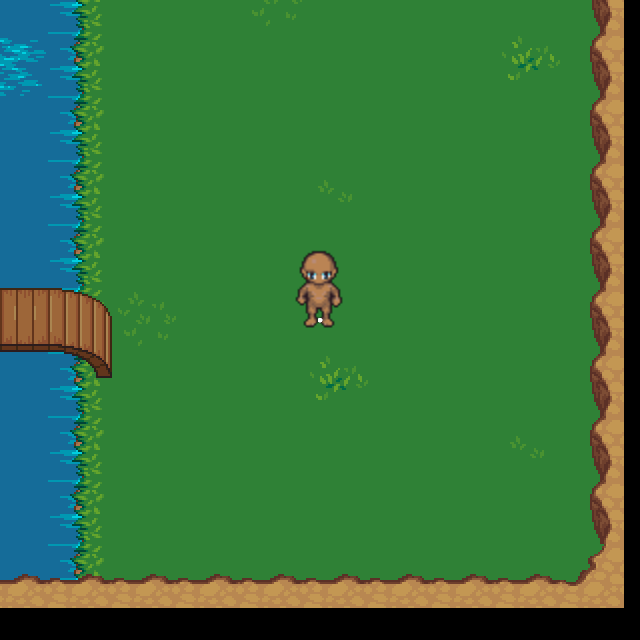 With less than 100 lines of code, we've imported our map, created a player object, created a player controller, and can run around our world. Impressive! STI has other features not covered by this tutorial such as a plugin system and several collision plugins. If you would like to learn more about STI, you can check it out on GitHub, read the documentation, or visit the support thread on the LÖVE forums. Landon "Karai" Manning is an independent game developer from Nova Scotia, Canada.